Cost-based pricing would say that digital media streamed to the home should always be less expensive than the same media delivered on physical disks in boxes delivered by UPS. Value-based pricing says that someone with a Roku who wants to see a show right now, not two days from now, and doesn't have a DVD player and doesn't want to hassle with putting disks in and out to get through a whole season of a TV show might pay more for the digital delivery. Since I like to buy the disks and then rip them to my video server at home running XBMC, I was happy to get the disks inexpensively. 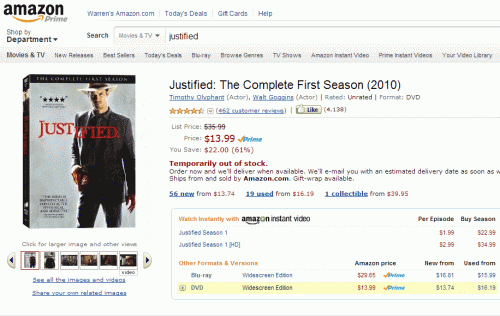 Up until the last month, I have been very happy with Amazon Prime, the service where you pay $80(?) for a year of free 2-day delivery. I am sure I have ordered more stuff from Amazon because of it, and I know I order it faster because I don't wait weeks with things in the shopping cart to group shipments. However, in the last month, I have had not one but two orders show up in 7-8 days instead of two. 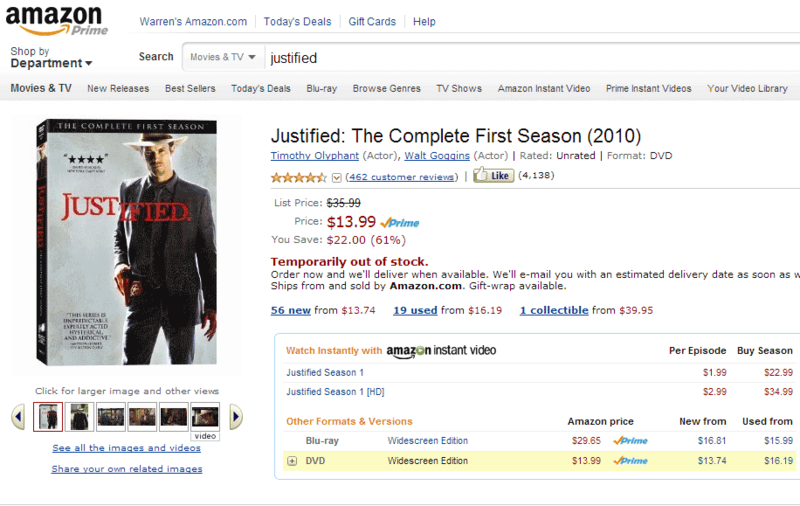 The first was a Batman Begins DVD, pre-ordered to ship on its release date (which it apparently did). It was shipped USPS, so there was obviously no hope that it would arrive in 2 days. The second was a new Nikon D50, which was back-ordered for about a week. directly correspond to any carrier-branded shipping services. This is obviously not very clear, but here is what I infer: When the item was back-ordered, they gave me an updated delivery date range, something like "estimated delivery Nov 2-10". What I infer from this email is that once they give you an estimated delivery date range, they feel like their obligation to ship 2-day is voided. The only obligation they now feel they have is to hit that date range. So, despite the fact that my camera shipped on Nov 2 and I paid for 2-day shipping, they feel they are meeting their obligations if it gets to me by Nov 10, the back end of their estimated range. The conclusion is not to feel sorry for me that I have to wait to play with my new toy, but that this may be the first sign of a program that is being gutted under profit pressure. When lawyers looking for loopholes take over the customer service and fulfillment department, things can go downhill pretty quickly. Note that the "est. delivery date" dodge really gives them carte blanche to get out of the 2-day obligation any time they want, since they set the estimates. As a note, I tried to confirm my interpretation with Amazon and have been unsuccessful. In the tradition of making itself one of the hardest companies in America to actually contact, one can't reply to their customer service email so I can't get an easy confirmation or clarification. I actually got and called their customer service phone number, which you will never find on their site (write this down: 1-800-201-7575). The person on the other end of the line was useless, not understanding that I wanted a clarification of the Amazon Prime rules rather than some resolution of a particular order. She couldn't access the emails I had sent to customer service or had received from them, and didn't seem to understand Amazon Prime rules, so she was no help. The only funny part was that as I kept trying to clarify what I wanted from her, she kept upping the gift certificate amount she offered me as compensation, despite the fact that I kept saying "I don't want money I want to know what the rules are". I think I ended up with $20 without even wanting it. Which makes me wonder why I can't reply to Amazon's customer service emails. I don't have a problem getting customer support via email rather than the phone, but to make this work I really need to keep working through to resolution with the same person, and the Amazon process makes this impossible.